For best GI absorption, do not combine with mealtime and give on an empty stomach. 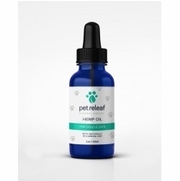 If administering a dropper is difficult, Hemp Oil can be given on top of a very small amount of food or peanut butter. Packaging: Dropper bottle 1 oz (30 ml). Contains 200 mg of active CDB.